For most people born in the Boston area, there’s nothing more grating than listening to an actor attempt a Boston accent. 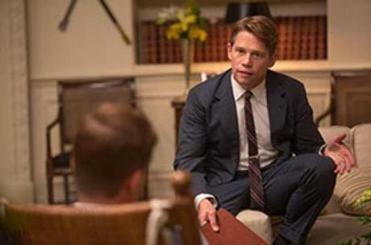 But as Robert F. Kennedy in a TV film, Jack Noseworthy comes by his accent honestly. For the Lynn native, getting the accent correct was only a small part of the responsibility he felt for his role in “Killing Kennedy.” The National Geographic Channel movie, which premiered last week, chronicles major points in the lives of President John F. Kennedy and Lee Harvey Oswald before they intersect in the president’s assassination on Nov. 22, 1963. Rob Lowe plays JFK. “I read the script, and I loved it. I thought it was really great,” said Noseworthy, a graduate of Lynn English High and the Boston Conservatory. He knew a little about Bobby Kennedy, but not enough. So he began to do research: reading biographies, watching documentaries. “I have an enormous amount of respect for him and an enormous amount of remorse for his own passing. There was so much promise. He was a really fascinating man,” Noseworthy said. Noseworthy was just 4 years old when he first appeared on stage, at Lynn’s Broadway United Methodist Church. He got his first professional role while a senior in college, in the traveling company of the Broadway hit “Cats.” The role alleviated some of his parents’ fears about making a living as an actor. But it was his membership in the actors’ union that sealed the deal. Noseworthy, who now lives in New York City, returned to his hometown a few years ago to film ‘‘Surrogates,’’ a sci-fi thriller with Bruce Willis. Noseworthy, who recently finished a run in a New York play, appeared in the 1993 movie “Alive,” a true-life story about a rugby team stranded in the Andes; Bon Jovi’s ‘‘Always’’ music video; and the lead in “Dead at 21,’’ MTV’s first scripted series, nearly 20 years ago. He also has a new movie waiting for distribution.